Q: What happens if 'Frozen Time' is attached to 'Infernal Obsession'? Does control revert to the owner? A: Yes. 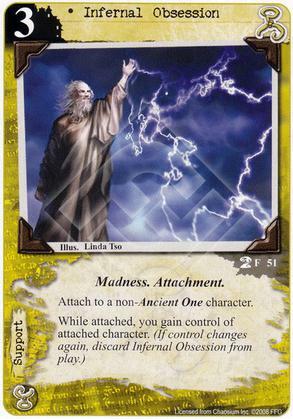 Infernal Obsession's passive ability is the only thing that gives control of the attached card. Anything that blanks that card text or removes the attachment would cause the character revert back to it's owner.